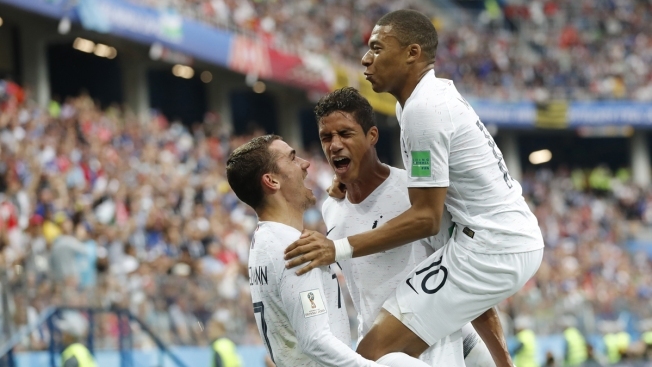 France's Kylian Mbappe, right, and Antoine Griezmann celebrate after Raphael Varane, center scored his side's first goal during the quarterfinal match between Uruguay and France at the 2018 soccer World Cup in the Nizhny Novgorod Stadium, in Nizhny Novgorod, Russia, Friday, July 6, 2018. France beat Uruguay 2-0 Friday, winning a World Cup semifinal spot with help from a blunder by Uruguayan goalkeeper Fernando Muslera. France took the lead five minutes before halftime with a header from defender Raphael Varane. Griezmann was also involved in the opener, providing the free kick from the right for Varane to head home. Uruguay started without key striker Edinson Cavani, who hadn't recovered sufficiently from a left calf muscle injury. Uruguay had given up only one goal in its first four World Cup matches, while France had scored seven — most in the 4-3 victory over Argentina in the round of 16. This was France's seventh quarterfinal and its fourth in the last six World Cups dating back to 1998 and the famous side led by Deschamps, Patrick Vieira, Zinedine Zidane and Thierry Henry — the so-called "Rainbow Team" from a multicultural France.